Phase-incremented pulses in NMR with applications (Shanmin Zhang). Advances in NMR studies of liquid crystals (R.Y. Dong). 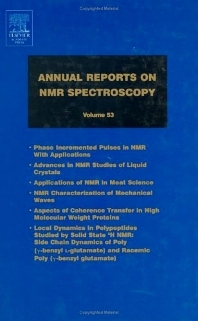 Applications of NMR in meat science (H.C. Bertram, H.J. Andersen). NMR characterization of mechanical waves (G. Madelin et al.). Local dynamics in polypeptides studied by solid state 2H NMR: side chain dynamics of poly(&ggr;-benzyl L-glutamate) and racemic poly(&ggr;-benzyl glutamate) (Toshifumi Hiraoki et al. ).